Nav.com, a free site and app for small business owners to access their business credit scores and get matched to financing options, announced it is hosting its 3rd Small Business Grant, in hopes of helping businesses facing financial burdens or challenges. To apply, entrants must sign up for a free Nav account and share via social media details about their business and a challenge that it is facing, explaining how the Grant would help elevate the small business to the next level. The grand prize winner of the Grant will be awarded $10,000. Prizes for a runner-up and second runner-up will also be given $2,000 and $1,000, respectively. "Small businesses represent more than 99% of all businesses in the country," said Levi King, Co-Founder and CEO of Nav. "They also represent the majority of businesses that are struggling with cash flow and other financial burdens, preventing owners from growing their businesses. 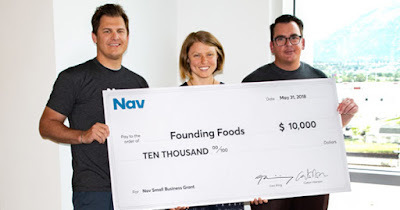 At Nav, we want to see every small business succeed, and this Grant is just another way of showing business owners that we know what they need and we're here for them." The deadline to enter is December 15, 2018. Winners will be selected and notified in early 2019. Earlier this year, Rachel Irons, owner of Founding Foods, and Chris Jones, owner of CJ's Bait & Tackle, each received $10,000 through Nav's Small Business Grant Program. "Applying for Nav's Small Business Grant was one of the best business decisions I've made," shared Jones. "In addition to getting the money, I also learned about business credit through my new, free Nav account. It's amazing all the information that I didn't know before I met the folks at Nav."